Ultimate value and speedâ€”HP PageWide Pro delivers the lowest total cost of ownership and fastest speeds in its class. Get quick two-sided scanning, plus best-in-class security features and energy efficiency. - Results you expect and lasting valueâ€”breakthrough total cost of ownership, the lowest in its class. - Print professional-quality color on a variety of papersâ€”perfect for office use. - Wait less, do more with unmatched speeds1â€”up to 55 ppmâ€”and the fastest first-page printing in its class. - Get fast two-sided scanning directly to email and the cloud with this LDAP-enabled MFP. - Manage tasks from a 4.3-inch (10.9 cm) touchscreen. Print MicrosoftÂ® Word and PowerPointÂ® files from USB. - Print from your mobile device with Wi-Fi DirectÂ® and NFC touch-to-print technologyâ€”no network needed. 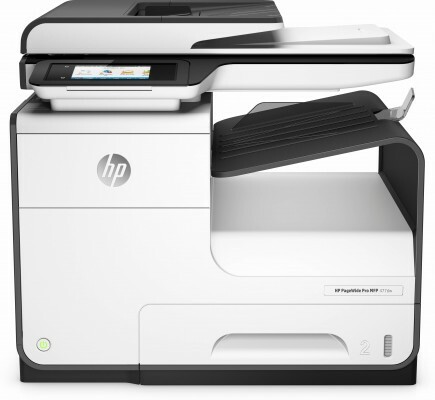 - Conserve with HP PageWide Technologyâ€”designed to use less energy than any MFP in its class. - Regulate color use and reduce printing costs with HP Color Access Control. - Help keep your printer secureâ€”from boot up to shutdownâ€”with secure boot and secure code integrity validation.